We’ve recently released updates for the Panoptes command-line interface and the Panoptes Client module for Python containing a few bug fixes. You can install the updates by running pip install -U panoptescli and pip install -U panoptes-client. Today we’ll be going over a couple of visual changes to familiar elements of the classify interface and new additions we’re excited to premier. These updates haven’t been implemented yet, so nothing is set in stone. Please use this survey to send me feedback about these or any of the other updates to the Zooniverse. Many respondents to my 2017 design survey requested that they be able to use the keyboard to make classifications rather than having to click so many buttons. One volunteer actually called the classifier “a carpal-tunnel torturing device”. As a designer, that’s hard to hear – it’s never the goal to actively injure our volunteers. We actually do support keyboard shortcuts! 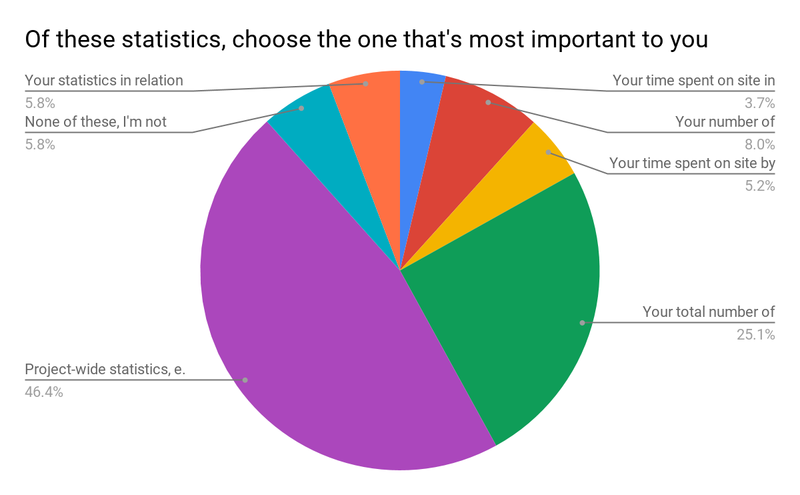 This survey helped us realize that we need to be better at sharing some of the tools our developers have built. The image above shows a newly designed Keyboard Shortcut information modal. This modal (or “popup”) is a great example of a few of the modals we’re building – you can leave it open and drag it around the interface while you work, so you’ll be able to quickly refer to it whenever you need. 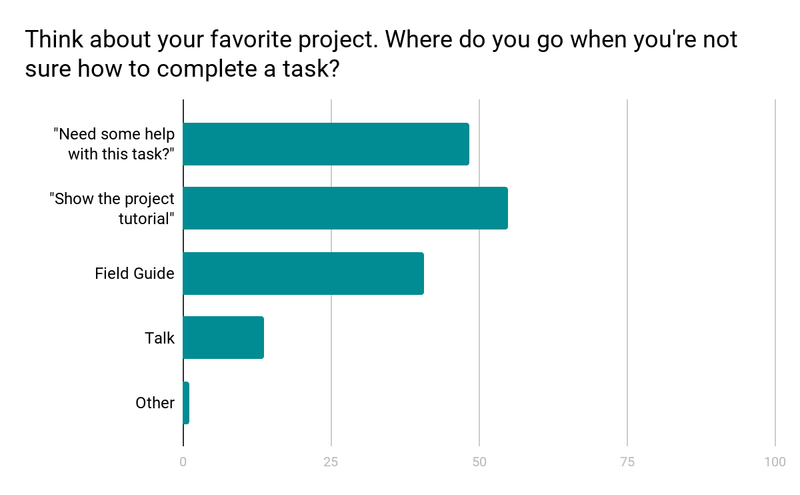 Another major finding from the design survey was that users did not have a clear idea where to go when they needed help with a task (see chart below). 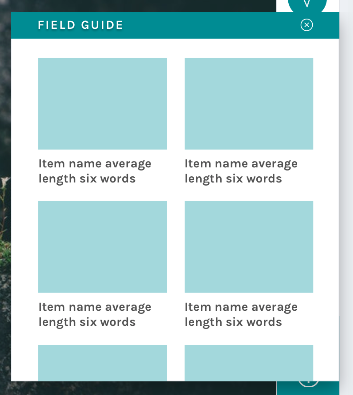 By placing the Field Guide button in a more prominent position and allowing the modal to stay open during classifications, we hope this tool will be taken advantage of more than it currently is. Using the mode gave me the basis on which to design; however, there’s quite a disparity between min and max amounts. Because of this disparity, we’ll be giving project owners with currently active projects a lot of warning before switching to the new layout, and they’ll have the option to continue to use the current Field Guide design if they’d prefer. Another major resource Zooniverse offers its research teams and volunteers is the Tutorial. Often used to explain project goals, welcome new volunteers to the project, and point out what to look for in an image, the current tutorial is often a challenge because its absolute positioning on top of the subject image. 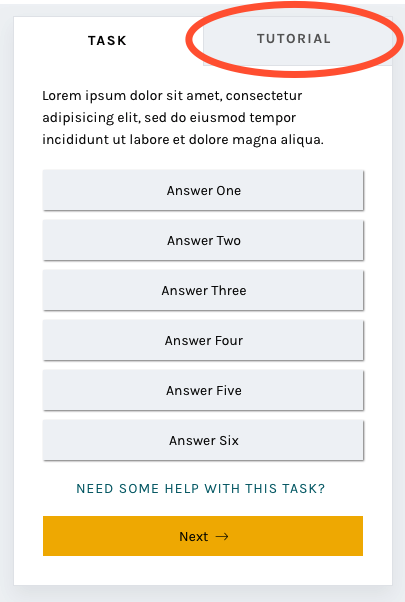 In this iteration of the classify interface, the tutorial opens once as a modal, just as it does now, and then lives in a tab in the task area where it’s much more easily accessible. You’ll be able to switch to the Tutorial tab in order to compare the example images and information with the subject image you’re looking at, rather than opening and closing the tutorial box many times. Possibly: A way to indicate that you’re finished for the day, giving you the option to share your experience on social media or find another project you’re interested in. Research teams often spend hours engaged in dialog with volunteers on Talk, but not everyone who volunteers on Zooniverse is aware or active on Talk. Adding a module on the classify page showing recent Talk posts will bring more awareness to this amazing resource and hopefully encourage more engagement from volunteers. When the project builder was created, we couldn’t have predicted the variety of disparate topics that would become Zooniverse projects. Originally, the subject viewer was designed for one common image size, roughly 2×3, and other sizes have since been shoehorned in to fit as well as they can. 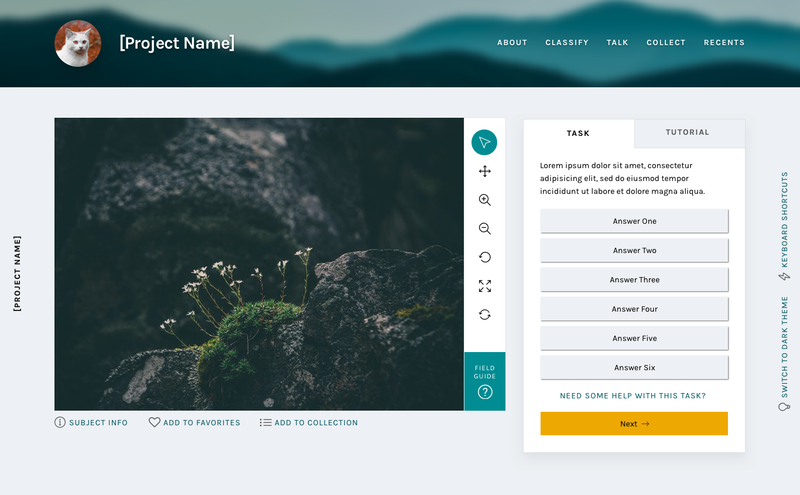 Now, we’d like to make it easier for subjects with extreme dimensions, multimedia subjects, and multi-image subjects to fit better within the project builder. By specifically designing templates and allowing project owners to choose the one that best fits their subjects, volunteers and project owners alike will have a better experience. Very wide subjects will see their toolbar moved to the bottom of the image rather than on the right, to give the image as much horizontal space as possible. Tall subjects will be about the same width as they have been, but the task/tutorial box will stay fixed on the screen as the image scrolls, eliminating the need to scroll up and down as often when looking at the bottom of the subject. I’m so excited for the opportunity to share a preview of these changes with you. Zooniverse is a collaborative project, so if there’s anything you’d like us to address as we implement this update, please use this survey to share your thoughts and suggestions. Since we’re rolling these out in pieces, it will be much easier for us to be able to iterate, test, and make changes. We estimate that the updates will be mostly in place by early 2019, so there’s plenty of time to make sure we’re creating the best possible experience for everyone. Thank you so much for your patience and understanding as we move forward. In the future, we’ll be as open and transparent as possible about this process. In this week’s edition of our Who’s who in the Zoo series meet Dr Sam Blickhan who leads the development of new Humanities projects here in the Zooniverse. I’m the IMLS Postdoctoral Fellow and Humanities Lead. I started in March of 2017 as a Postdoc, and started to take on more Humanities Lead duties in 2018. What did you do in your life before the Zooniverse? Before coming to the Zooniverse I was a student. I did my undergrad at the University of Iowa, studying Medieval English Literature and classical Voice Performance. Then I did a Masters in Musicology at Oxford, and went on to do a PhD in Musicology at Royal Holloway, University of London, writing about the palaeography of medieval music notation. I’ve always been interested in technologies of writing and the development of language, as well as digital approaches to research and teaching, so being able to work on transcription projects with Zooniverse is a really great way to continue that academic work in a not-so-traditional format. What does your typical working day involve? Always coffee. Depending on what I’m working on, my day could involve communication with research teams, project planning/design/development with my Zooniverse colleagues, grant writing, data analysis, preparing conference papers & presentations, professional development, and/or researching & writing articles. It varies quite a bit from day to day, which I love — I never, ever get bored, and I get to meet lots of interesting people! How would you describe the Zooniverse in one sentence? Zooniverse is as much or as little as you want it to be; a way to relax, to learn, and engage with others. When I was in grad school I used to volunteer on Seafloor Explorer as a way to relax — I felt like I could turn off the part of my brain that was doing lots of critical thinking, while still doing something productive and interesting. The first project I was actually a part of developing was Anti-Slavery Manuscripts. What’s been your most memorable Zooniverse experience? I’m lucky to be able to travel regularly for my job, and I love meeting people from other platforms and/or institutions and learning about how their crowdsourcing projects work. I was part of a panel discussion at the IMLS (Institute of Museum and Library Services) in 2017, and got to meet some people who have been doing really amazing work for a long time. It was exhilarating to be able to have conversations about public research methods and access to archival materials and data, and learn from these larger communities of researchers and advocates, as well as show them what tools and opportunities for research we at Zooniverse have to offer. What are your top three citizen science projects? SCOTUS Notes (www.scotusnotes.org) is one of my favorite new projects. I’m a bit of a politics junkie, so reading the Justices’ comments can be a very interesting look at the thought processes behind these Supreme Court decisions. I think that the American Soldier project (https://www.zooniverse.org/projects/tkotwim/the-american-soldier) is also incredible. The soldiers’ responses to the questions are often very moving and powerful to read. Outside the Zooniverse, I’m a big fan of the Colored Conventions Project (http://coloredconventions.org/) — I was lucky enough to meet some of their team at a conference last year, and they do an incredible job of engaging their community in a positive way, and reminding the public how important it is to keep re-examining history and working to create space for those who have been overlooked. I’ve learned a lot from listening to them and watching their work. What advice would you give to a researcher considering creating a Zooniverse project? Look at as many other projects as you can! Really spend some time classifying, but also try to get a sense of what the volunteer and research communities are like across projects. Reach out to other project owners, as well as volunteer and Talk moderators, and ask about their experiences. 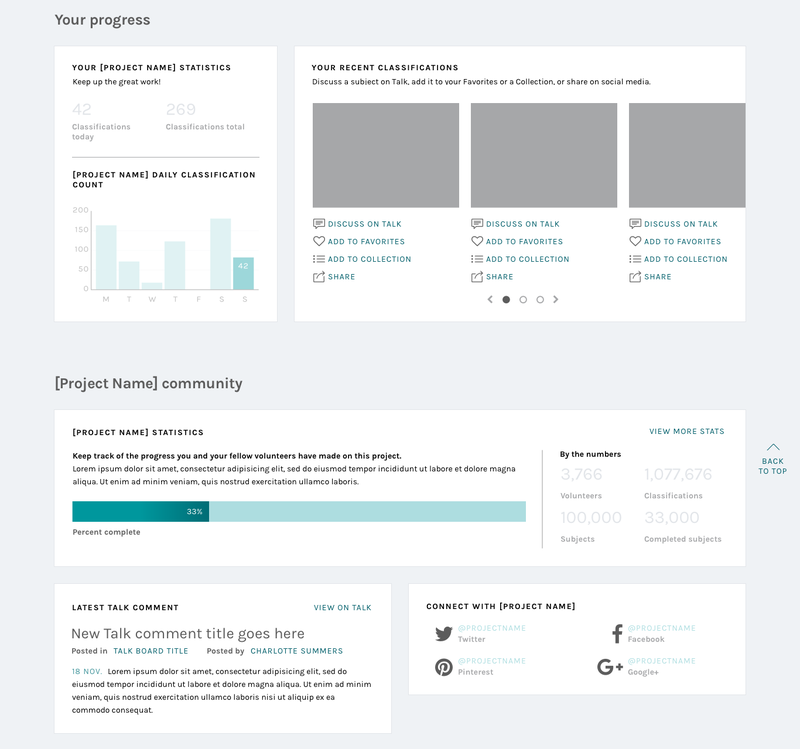 It’s hard to anticipate what it will be like to run a project if you haven’t yet participated in one. Learn by doing! When not at work, where are we most likely to find you? Since it’s summer, I’m probably outside running, biking, or on a patio with friends. I love to make things and enjoy knitting & embroidery in particular. Music is a big part of my life, too — I go to lots of concerts and play music with friends whenever I can. Today and in the next post, we’ll take a look at the reasoning behind specific changes to the classifier that we’ve already started to roll out over the past few months. We’ve had good discussions on Talk about many of the updates, but I wanted to reiterate those conversations here so there’s just one source of information to refer back to in the future. In case you missed it, the first blog post in this series previews the complete new classify layout. As a reminder, if you have feedback about these changes or anything else on the site you’d like to see addressed, please use this survey link. 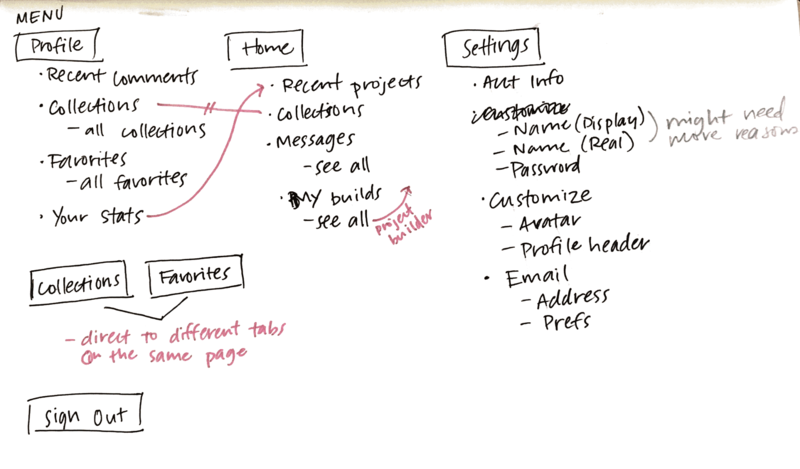 We started with a rethinking of each project’s navigation bar. The new design features cleaner typography, a more prominent project title, and visual distinction from the sitewide navigation. It also includes the project’s home page background image, giving the project visual distinction while keeping the classify interface itself clean and legible. It’s also responsive: on smaller screen heights, the height of the navigation bar adjusts accordingly. The most important goal we solved in making this change was to separate the project navigation from the site navigation. During my initial site research and in talking to colleagues and volunteers, many found it difficult to distinguish between the two navigations. Adding a background, a distinct font style, and moving the options to the right side of the page accomplishes this goal. In conjunction with adding the background image to the navigation bar, the background image was removed from the main classify interface. It was replaced with a cool light grey, followed quickly by the dark grey of the Dark Theme. Legibility is one of the main goals of any web designer, and it was the focus of this update. By moving to clean greys, all of the focus is now on the subject and task. There are some really striking subject images on Zooniverse, from images of the surface of Mars to zebras in their natural habitat. We want to make sure these images are front and center rather than getting lost within the background image. The Dark Theme was a suggestion from a Zooniverse researcher – they pointed out that some subject images are similar in tone to the light grey, so a darker theme was added to make sure contrast would be enough to make the image “pop”. We love suggestions like this! While the team strives to be familiar with every Zooniverse project, the task is sometimes beyond us, so we rely on our researchers and volunteers to point out anomalies like this. If you find something like this, you can use this survey to bring it to my attention. Another great suggestion from a Zooniverse volunteer was the addition of the project name on the left side of the screen. This hasn’t been implemented yet, but it’s a great way to help with wayfinding if the interface is scrolled to below the navigation bar. 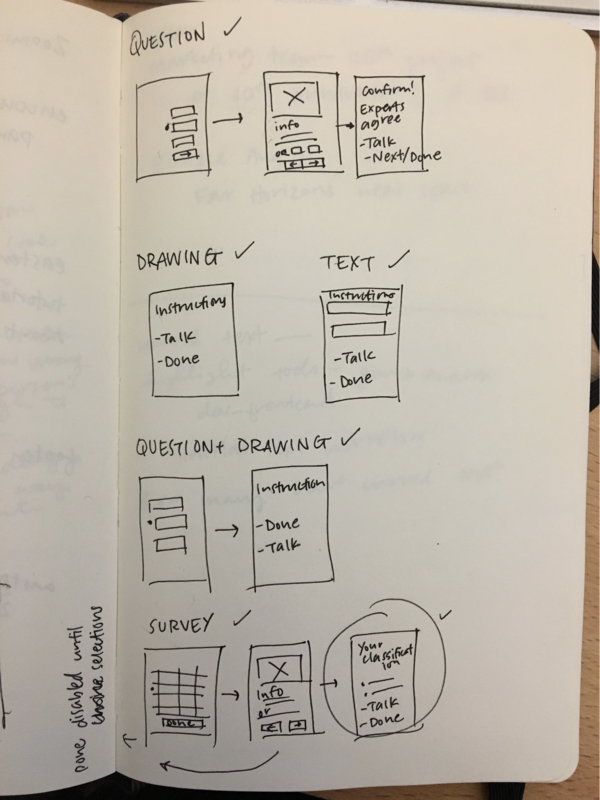 By enclosing the task and its responses in a box rather than leaving it floating in space, the interface gives a volunteer an obvious place to look for the task across every project. Adjusting the typography elevates the interface and helps it feel more professional. One of the most frequent comments we heard in the 2017 survey was that the interface had far too much scrolling – either the subject image or the task area was too tall. 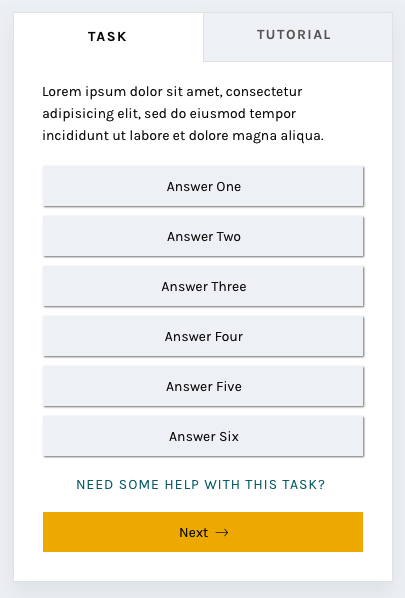 The subject image height will be addressed at a later date, but this new task area was designed specifically with scrolling in mind. I used the averages I found in my initial project audit and the average screen height (643 px) based on Google Analytics data from the same time period to design a task area that would comfortably fit on screen without scrolling. It’s important to note that there are always outliers in large-scale sites like Zooniverse. While using averages is the best way to design for most projects, we know we can’t provide the most optimal experience for every use case. You’ll also notice the secondary “Tutorial” tab to the right of the “Task” label. This is a feature that’s yet to be implemented, and I’ll talk more about it in the next post. The next installments in this series will address the additional updates we have planned, like updated modals and a whole new stats section. Zooniverse began in 2007, with a galaxy-classifying project called Galaxy Zoo. The project was wildly successful, and one of the lead researchers, Chris Lintott, saw an opportunity to help other researchers accomplish similar goals. He assembled a team of developers and set to work building custom projects just like Galaxy Zoo for researchers around the world. But the team started to wonder: How can we improve the process to empower researchers to build their own Zooniverse projects, rather than relying on the team’s limited resources to build their projects for them? 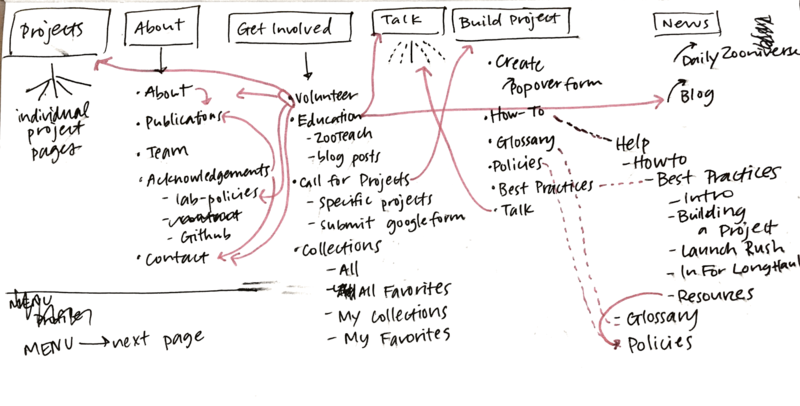 Thus, the project builder (zooniverse.org/lab) was born. In the first year of its inception, the number of projects available to citizen scientist volunteers nearly doubled. Popularity spread, the team grew, and things seemed to be going well. Three years after the project builder’s debut, I was hired as the Zooniverse designer. With eight years’ experience in a variety of design roles from newspaper page design to user experience for mobile apps to web design, I approached the new project builder-built projects with fresh eyes, taking a hard look at what was working and what areas could be improved. Over the next week, I’ll be breaking down my findings and observations, and talking through the design changes we’re making, shedding more light on the aims and intentions behind these changes and how they will affect your experience on the Zooniverse platform. If you take one thing away from this series it’s that this design update, in following with the ethos of Zooniverse, is an iterative, collaborative process. These posts represent where we are now, in June 2018, but the final product, after testing and hearing your input, may be different. We’re learning as we go, and your input is hugely beneficial as we move forward. Here’s a link to an open survey in case you’d like to share thoughts, experiences, or opinions at any point. My first few weeks on the job were spent exploring Zooniverse, learning about the amazing world of citizen science, and examining projects with similar task types from across the internet. I did a large-scale analysis of the site in general, going through every page in each section and identifying areas with inconsistent visual styles or confusing user experiences. After my initial site analysis, I created a list of potential pages or sections that were good candidates for a redesign. The classify interface stood out as the best place to start, so I got to work. First, I identified areas of the interface that could use visual updates. My main concerns were legibility, accessibility, and varying screen sizes. With an audience reaching to the tens of thousands per week, the demographic diversity makes for an interesting design challenge. 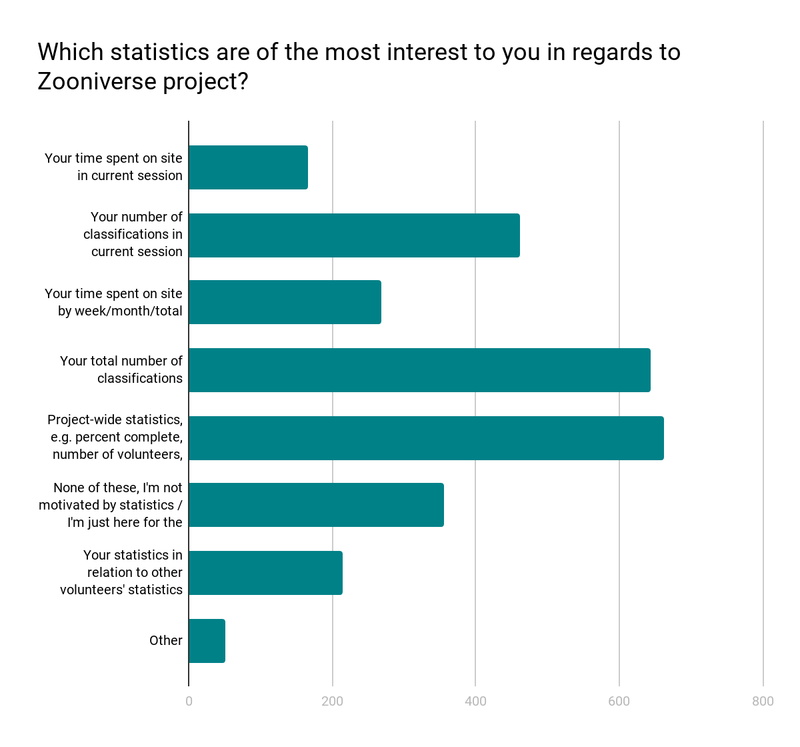 Next, I conducted a comprehensive audit of every project that existed on the Zooniverse in March 2017 (79 in total, including custom projects like Galaxy Zoo), counting question/task word count, the max number of answers, subject image dimensions, field guide content, and a host of other data points. That way, I could accurately design for the medians rather than choosing arbitrarily. When working on this scale, it’s important to use data like these to ensure that the largest possible group is well designed for. Next, I focused on usability. To ensure that I understood issues from as many perspectives as possible, I sent a design survey to our beta testers mailing list, comprising about 100,000 volunteers (if you’re not already on the list, you can opt in via your Zooniverse email settings). Almost 1,200 people responded, and those responses informed the decisions I made and helped prioritize areas of improvement. No consensus on where to go when you’re not sure how to complete a task. Many different destinations after finishing a task. Too much scrolling and mouse movement. Would like the ability to view previous classifications. Need for feedback when doing classifications. Finding new projects that might also be interesting. In the next few blog posts, I’ll be breaking down specific features of the update and showing how these survey findings help inform the creation of many of the new features. Some of these updates will look familiar, as we’ve already started to implement style and layout adjustments. I’ll go into more detail in subsequent posts, but at a high level, these changes seek to improve your overall experience classifying on the site no matter where you are, what browser you’re using, or what type of project you’re working on. Visually, the site is cleaner and more professional, a reflection of Zooniverse’s standing in the citizen science community and of the real scientific research that’s being done. Studies have shown that good, thoughtful design influences a visitor’s perceptions of a website or product, sometimes obviously, sometimes at a subliminal level. By making thoughtful choices in the design of our site, we can seek to positively affect audience perceptions about Zooniverse, giving volunteers and researchers even more of a reason to feel proud of the projects they’re passionate about. It’s important to note that this image is a reflection of our current thought, in June 2018, but as we continue to test and get feedback on the updates, the final design may change. One benefit to rolling updates out in pieces is the ability to quickly iterate ideas until the best solution is found. We estimate that the updates will be mostly in place by early 2019. This is due in part to the size of our team. At most, there are about three people working on these updates while also maintaining our commitments to other grant-funded projects and additional internal projects. The simple truth is that we just don’t have the resources to be able to devote anyone full-time to this update. The timeline is also influenced in a large part by the other half of this update: A complete overhaul of the infrastructure of the classifier. These changes aren’t as visible, but you’ll notice an improvement in speed and functionality that is just as important as the “facelift” portion of the update. We’ve seen your feedback on Talk, via email, and on Github, and we’re happy to keep a dialog going about subsequent updates. To streamline everything and make sure your comments don’t get missed, please only use this survey link to post thoughts moving forward.